"The National Gallery represents and encapsulates the history of art, and the history of art changes the whole time", says Sir Nicholas Penny, Director of the National Gallery. In an interview with Garrett Curran, Credit Suisse CEO of UK & Ireland, he explains how he wants to embrace that change. Garrett Curran: Nick, how would you describe the role of Director of the National Gallery? Nicholas Penny: I have to represent the institution, and I think that's partly an ambassadorial job. With Credit Suisse, we're talking about a major partnership which enables us to put on spectacular exhibitions, and it's wonderful the way people think that I put them on, but of course, it's the curators who are really responsible for these exhibitions. We've got a great team of designers here, we've got wonderful registrars, but the ideas come from the curators. What ambition did you set for yourself and for the institution whenever you took on the role? And at this point, do you feel they've been achieved? I do have ambitions for the National Gallery, but they're very long-term. I rather expect to see some of them fulfilled long after I've left. I've always wanted the National Gallery to continue to be, actually, more of a centre of scholarship, and I think that has succeeded. I do think a lot about the distant future, especially around the degree to which the National Gallery should grow and change. It does represent and encapsulate the history of art, and the history of art changes the whole time. For example, should the Gallery include American paintings? Are they really part of the tradition of western European painting? Do they extend it and continue it? I think they certainly do, so I'm very pleased that we were able to buy a really great American painting of the very early 20th century by Bellows. That's changed the direction of the Gallery in a quite important way. Thinking more in terms of new initiatives that you've taken in the social media age to widen the awareness of the National Gallery. Has the use of social media or the cinema screenings been in direct response to some of these changes? Introducing social media has been very important and extremely successful. The way we've managed to present great exhibitions like the Leonardo exhibition which, in many cases, lots of people couldn't see… It shared some of that experience to those people, and people all round the world. But then I saw Whistlejacket, our great painting of a horse by Stubbs, and it was early in the morning, so there weren't many people in the Gallery, and there was just this one little girl standing underneath the horse as her proud parents photographed her. You can't be opposed to this, because people are streaming images all over the world of their experience in the Gallery, and also they are reinforcing their own memories of the Gallery. So maybe we're going to sell a few fewer postcards, but we're going to get publicity, which is more important for us and we're going to enhance the experience of people in the Gallery as well, as long as it's properly regulated. Let's move on to the topic of exhibitions. You're very experienced and skilled, many decades organising exhibitions. You're not just the leader of one of the world's most renowned art institutions, but also you're part of a network that works together and collaborates to create these exhibitions. Can you tell us what it's like to liaise with these different galleries and museums to put together exhibitions? One does realise two things after a while: one is that, with the other major institutions, like, the Prado in Madrid or the Hermitage in St Petersburg or the Louvre that our permanent collection remains, has some integrity, and people can see the great works of art you'd expect to see here. And at the same time, we're putting on loan exhibitions. So, the balance between those two is something which we all have to be careful about. The really important thing is, when you negotiate with those institutions, to get them to think about their future and what they're going to require from you. On the other hand, you should recognise that smaller institutions, which have one or two great works of art which you want to borrow, that is a huge request to make, and I feel it's a terrible mistake for museum directors of institutions like this to think that it's easy or they're bound to agree. Finally, sometimes you get a great surprise. When we put on with Credit Suisse the great Veronese exhibition here, I remember going to the church of San Giorgio in Braida, in Verona, and you couldn't imagine a more helpful and obliging priest than the priest of San Giorgio. He was delighted that I was interested in lots of things in his church. But for him, although it was, of course, a great loss to have that great altarpiece leave that church, he also thought of it as a great honour. You were talking about the challenge of negotiation, but also there's a fair amount of persuasion and charm which goes into securing successful loans of artwork. Perhaps you'd give us a broader sense of what those financial and logistic challenges really do involve. There can be all sorts of complications with the organisation of exhibitions. There's the question of government indemnity and insurance. Our exhibitions are possible because we obtain government indemnity for loans and this is a really important arrangement for us. But there are circumstances in which that may not work, or people may not be completely convinced that that is the best way of doing things. In fact, on occasions, we have had to recruit the assistance of government itself. How does the National Gallery engage the next generation of art lovers, Nick? We have a very large school programme, which Credit Suisse supports. But I think it's extremely important that we don't just wait for schools to come to us, that we teach teachers how to use our facilities – namely, the programmes and images that we can provide. I think it's very important also that we try to reach school children that, actually, don't come to the National Gallery. I'm actually very interested in the new City Year UK programme which we are involved in and collaborating with Credit Suisse to deliver. That brings us nicely to my highlight of our partnership: The Teach First event we hosted here in February 2014. I thought it was appropriate that we had one of the leading art institutions of the UK as a platform for the launch of that STEM (Science, Technology, Engineering and Mathematics) challenge. I thought there was a lot of nice symbolism there, and engaging business leaders. We had business, arts, sciences all in one. Yes. There was some thought behind it rather than merely, 'This is a splendid setting.' It suggested that culture shouldn't be a divided thing. So, I really appreciated that and I thought that was a spectacularly successful event. What role does the National Gallery play in the arts scene in the UK? We attract nearly 6.5 million visitors a year, and that's, I think, two million up on what it was when I became Director in 2008. I think we are the second-most visited art institution in the country and, of course, one of the most important tourist attractions. The challenge is that of helping people to feel that the art of the past is relevant today, has a contemporary appeal, and we have to find new ways of doing that. You mentioned overseas visitors: that's been a crucial part of that, a two-million increase over the past seven years. Domestic visitors increasing but, of course, we are one of the reasons people come to London. The National Gallery, alongside our great sister institutions, are a huge attraction for foreign visitors. And we have to constantly think of new ways of helping them to enjoy the National Gallery – foreign-language guides are an aspect of that. How do you see the role of the National Gallery moving forward? 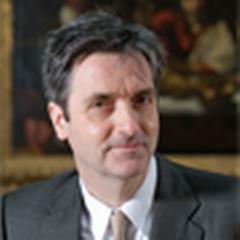 The great thing is that the trustees have appointed a former colleague of mine, Gabriele Finaldi, who is the Deputy Director of the Prado in Madrid and has helped hugely to modernise that great institution. He used to work here as a curator. I know him quite well and so I'm one of those really lucky directors who feels that the institution's going into really safe hands. I know that he will change a lot of things and I'm really in favour of that too, because I know that, in the changing world, the Gallery has to. In order to remain fundamentally the same, it has to change in a great many ways. It is a very dynamic institution and I hope it will remain that, and I hope that Credit Suisse will continue to help it to be dynamic in the future. What has Credit Suisse sponsorship meant for you and what have been the highlights of the partnership between the institutions? The highlight for the partnership with Credit Suisse for me was the fact that it suddenly landed on my lap. I had this great feeling that a lot of work had been done by a lot of other people, but also, above all, that it was a tribute to the Gallery, because Credit Suisse were so keen on being partners of the National Gallery. It was 2008, I was a new Director and it was very nice to know, in the midst of the global financial crisis, there was Credit Suisse to hold my hand, so that gave me a tremendous confidence. Well, we feel very honoured and privileged to have made a small contribution to the presence of these Titians on the wall. To draw to a close, on behalf of everyone at Credit Suisse, we'd like to thank you for your leadership and your stewardship of this iconic institution and, of course, to wish you the best with the next chapter of your career. Dr Nicholas Penny (born 21 December 1949) was Director of the National Gallery, London from February 2008 to August 2015. After obtaining his doctorate from the Courtauld Institute, Nicholas Penny began his career as a lecturer in art history at the University of Manchester. His first museum position was as Keeper of the Department of Western Art at the Ashmolean Museum in Oxford. He was Clore Curator of Renaissance Painting at the National Gallery between 1990 and 2002, but spent 2000-2002 as Andrew W. Mellon Professor at the Center for Advanced Study in the Visual Arts in the National Gallery of Art, Washington. From 2002-2008 he was Senior Curator of Sculpture and Decorative Arts at the National Gallery of Art, Washington. He is the author of many books and articles on both painting and sculpture and the history of collecting and of taste, including scholarly catalogues, introductory texts for the student, and critical reviews for the general reader. His books include "Raphael" (with Roger Jones), "Taste and the Antique" (with Francis Haskell) and "The Materials of Sculpture".